Thus revealing his pre-1980s musical awareness. Fans of the latter vintage would know better the wordplay on those lyrics in Rush's Spirit of Radio. Its cynicism is more appropriate to the rest of Friedman's column. Q: If it is a question of a good example, the State has not proved to be very exemplary either. Governments today pile up debts to heights never seen before. A single country like Germany spent no less than 43.9 billion Euros just on interest payments to banks; in other words, for the fact that despite all our wealth we have lived beyond our means. Those interest payments alone would be enough to provide food for a year for all the children in developing countries. Worldwide, since the onset of the financial crisis, government debt has increased by 45 percent—by now totaling more than 50 trillion dollars—inconceivable figures, and a completely unprecedented situation. In 2010 the member states of the European Union alone are taking out more than 800 billion Euros of new loans. The new debt in the United States government budget is pegged at 1.56 trillion dollars, the high point of all time. The Harvard Professor Kenneth Rogoff says, therefore, that there is no normality any more, but only an illusion of normality.Certainly generations to come are being burdened with colossal debts. Isn't that also an insanely big moral problem? A: Naturally, because we are living at the expense of future generations. In this respect it is plain that we are living in untruth. We live on the basis of appearances,and the huge debts are meanwhile treated as something that we are simply entitled to. Here, too, everyone understands in theory that it would require careful deliberation to recognize again what is really possible,what one can do, and what one may do. And yet people do not take it to heart. Above and beyond the individual financial plans, a global examination of conscience is indispensable. The Church has tried to make a contribution in this regard with the encyclical Caritas in veritate. It does not give answers that would solve everything. But it is a step toward putting things into another perspective and looking at them not only from the point of view of feasibility and success, but from the point of view that sees love of neighbor as something normative and is oriented to God's will and not just to our desires. In this respect impetus would have to be provided in this way so that a change of consciousness can really come about. A few things to note. The question is as long as the answer. By the end of the question, economics professor Ken Rogoff sounds like the dudes who wrote The Matrix. Benedict's answer -- as Ryan's carefully worded excerpt acknowledges -- says absolutely nothing about budget deficits per se, and especially not anything about the right way to address them. It's as much, if not more so, a critique of private debts as public ones to the extent that it addresses Seewald's 10-clause question at all. Paul Ryan supports Scott Walker, the union-busting governor of Wisconsin. Why do they hate the Pope? UPDATE: Washington Post's Dana Milbank with more about the Georgetown even. Never, ever, appear on the cover of Pilka Nozna. There must be a curse. 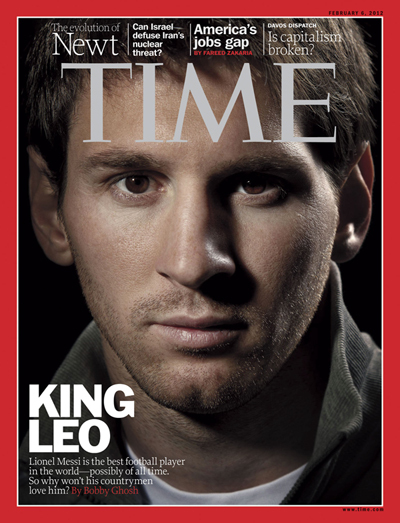 Never, ever, appear on the cover of Time magazine. There must be a curse. Who said the following today? We need to end Barack Obama's presidency before Barack Obama's presidency ends our way of life. Although your reaction to (d) may be, Who?, he is in fact the Chairman of the Republican National Committee. And yes, he said it, at an event podium (15 minute mark) in Scottsdale Ariz. including Mitt Romney and John McCain, the two most recent Republican candidates for US president. Do they think about what the words coming out of their mouths actually mean? Al-Shudokhi: The group (Al Qaeda in the Arabian Peninsula) has some demands which you can convey as they are. I am entrusted with this mission as a sign that everything is alright. I have been directed to talk plainly and tell you who I am and what is my name, since the state (Saudi Arabia) knows me. Ambassador: Since the state knows you, why do not you tell me your name? Al-Shudokhi: My name is Misha'al Mohammed Al-Shudokhi. Ambassador: Are you from Qassim? Ambassador: It seems that you have forgotten the accent of Qassim people. Al-Shudokhi: No, I did not. We were brought up in Yemen, and this has affected my accent. Ambassador: Qassim people would never lose their accent. Al-Shudokhi: I am from Buraidah, take it as you like. When the British troops arrived at Lexington and Concord in April 1775 expecting to force the peasantry into surrender, something they had done quite well in Ireland, Scotland, Wales, and England, they suddenly found they weren't up against peasants, they were up against Americans. Later in the same speech, Newt promised that a President Gingrich will seek a global treaty establishing a human right to keep and bear arms. Coming to Ireland yesterday was a very short journey for me, leaving my office in Frankfurt at 3 pm and arriving in downtown Dublin at 6 pm. On the way from the airport my Counsellor, who is accompanying me today, remarked that Ireland, however, has apparently come a long way compared to the time when she visited Ireland for the first time as a backpacking student almost 20 years ago in the early 1990s. While she recalled that her first impression of travelling from the airport downtown was rather sad, with run down warehouses and poor residential buildings, the picture has completely changed: modern office buildings and residential areas line the streets on the short trip from the airport to downtown nowadays. This is anecdotal evidence, of course, but I think it depicts in a nutshell Ireland’s truly remarkable economic development over the last 20 years.